Save yourself hours of researching the different types of legal objections with the Objection Cheat Sheet. 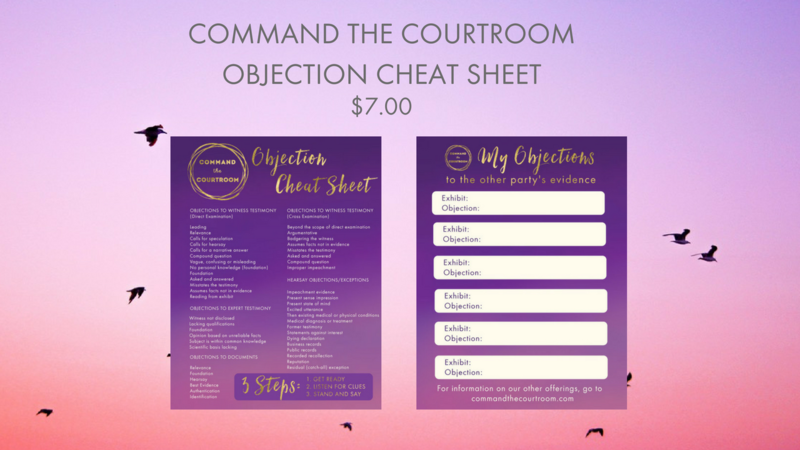 With the Objection Cheat Sheet, you'll have all possible legal objections you might use to witnesses or evidence - in one place. Use it to prepare for trial and as you try your case in the courtroom. I understand no attorney-client relationship is created by my enrollment in this course. I understand this course is for educational purposes only and is not the rendering of legal advice. I understand no guarantees have been made regarding the outcome of my case. I understand past results do not guarantee future results. I understand I need to consult with an attorney regarding the specifics of my case.